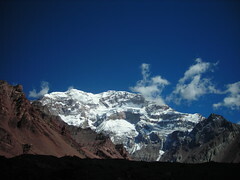 Aconcagua, at 6962m / 22.841 ft, is the highest mountain on the American Continent. 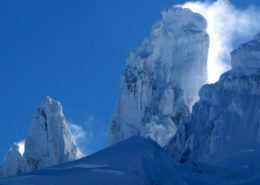 It is one of the Seven Summits, composed of the highest mountains on the seven continents. 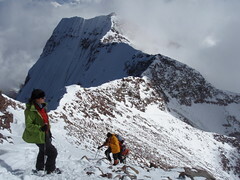 Aconcagua’s Normal Route, while requiring excellent physical conditioning, can be ascended by people who do not have a high level of technical mountain experience, enabling them to reach one of the highest points on the Earth. Because of the low pressure of oxygen at altitude, some people feel sick, get a headache and in some cases, develop mountain sickness. 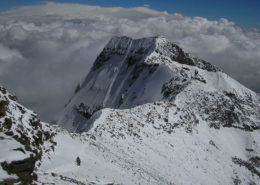 Our itinerary is designed to reduce the possibility of suffering altitude related problems. Our ascension up the mountain is gradual and strategically combined with rest days. 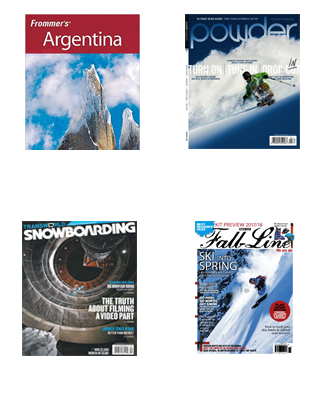 Better quality equipment: The North Face tents, pulse Oximeter, hyperbaric chamber, communication equipment. Santiago, Chile and Buenos Aires, Argentina are your two options for connecting with same-day flights to Mendoza. Your guide will pick you up at the airport and bring you, via private transport, to your hotel. 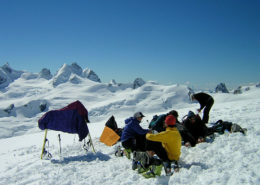 At the hotel, you will gather with the guides and the rest of the group to go over the expedition plan and check your gear. In the evening, at a restaurant that offers typical Argentinean food, we will enjoy a Welcome Dinner. After obtaining Aconcagua Park Permits, we will travel by vehicle 112 miles/ 180 kilometers northwest to Penitentes. Along the way, we will see many vineyards and valleys as we follow and cross the turbulent waters of the Mendoza River. In Penitentes, we will stay at an Hotel. We will also use the hotel as our staging ground to organize the loads that will be transported by mules. On route to the Park entrance, we will have a brief view of Puente del Inca, a natural bridge formed by sulfur thermal waters. 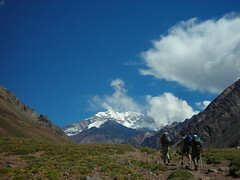 We will enter the Park via the Quebrada de Horcones, and from here, we will get a spectacular view of the South Face of Aconcagua. After approximately three hours of hiking, we will arrive at Confluencia and be rewarded with well-earned snacks and appetizers. 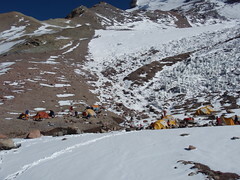 A day of trekking on dark glaciers will bring us to Plaza Francia lookout where it is common to observe, in the distance, large avalanches on the South Face of Aconcagua. After lunch, we will start our return to Confluencia where, as part of our acclimatization program, we will sleep a second night. 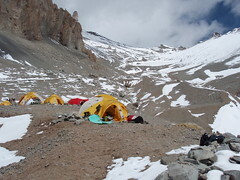 A beautiful 12,5 mi/20 km valley separates Confluencia camp and our Base Camp: Plaza de Mulas. 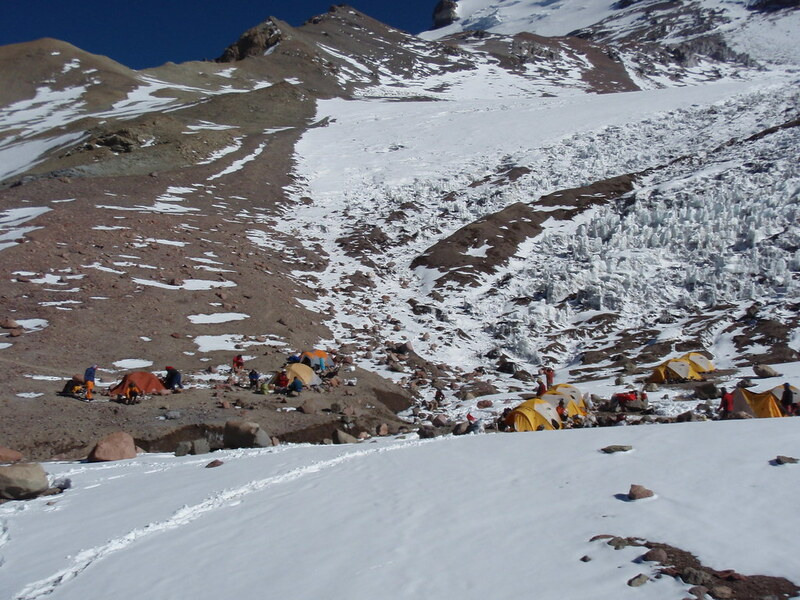 In a long and demanding day, we will traverse Aconcagua’s west side. Crossing rivers will be part of our path across Playa Ancha (Wide Beach), an extensive flat and sandy glacial valley which permits us to slowly gain altitude. After crossing Playa Ancha, the terrain becomes markedly steeper, allowing us to quickly gain altitude until we arrive at the Colombia Refuge, destroyed years ago by a winter storm. A short break will allow us to recuperate enough energy for the final challenge of the day: the steep “Cuesta Brava”. Once this final section is complete, we will arrive at Base Camp Plaza de Mulas. This day takes approximately 8 hours. Adapting to altitude requires time to rest and recover your energy. Carrying our food and equipment to Camp Canada not only reduces the amount that we will need to carry up on Day 9, but also serves to further our acclimatization. 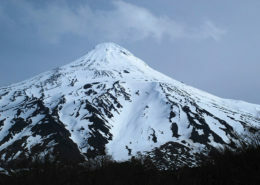 Our efforts for this hard day will be rewarded with beautiful views of Mt.Cuerno, Mt. Plomo, Mt. Juncal and the other mountains surrounding us. This will be our second rest day at Plaza de Mulas. We will practice using crampons on the Horcones Glacier and, after lunch, we will prepare our gear for the ascent towards the summit. The ascent to Camp 1 Canada takes about 4 hours. The path zigzags over the northern part of the West Face and provides us with an incredible view of the entire valley and of the surrounding mountains. 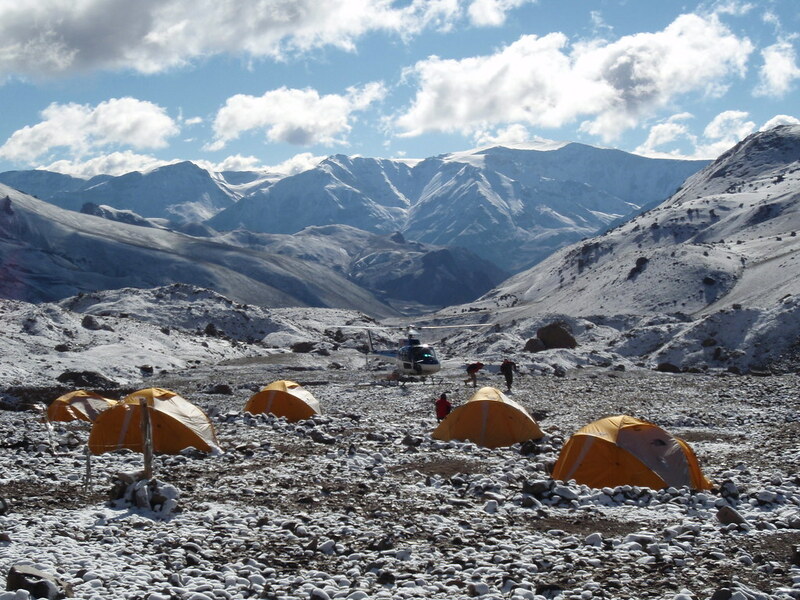 With the help of porters, we will set up our camp and later we’ll rest, hydrate ourselves and enjoy a magnificent sunset while we eat our dinner. 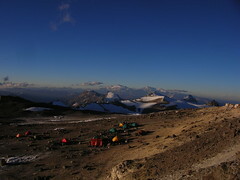 We will ascend to Camp 2 “Nido de Cóndores” (Condors Nest) in approximately 5 hours. The panorama is increasingly more intense as we progress and, at this altitude, you can see the Andean Cordillera from North to South. 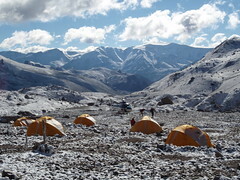 We again will have the help of our porters to transport our equipment and to set up camp. It is important to continue with our acclimatization and gradual ascent. For this reason, we will concentrate on recuperating our energy for the last part of the expedition. This day will be spent taking a short walk to the summit of Mt. Manso 17.700 ft / 5400 m and to some other view points around Camp Nido de Cóndores. 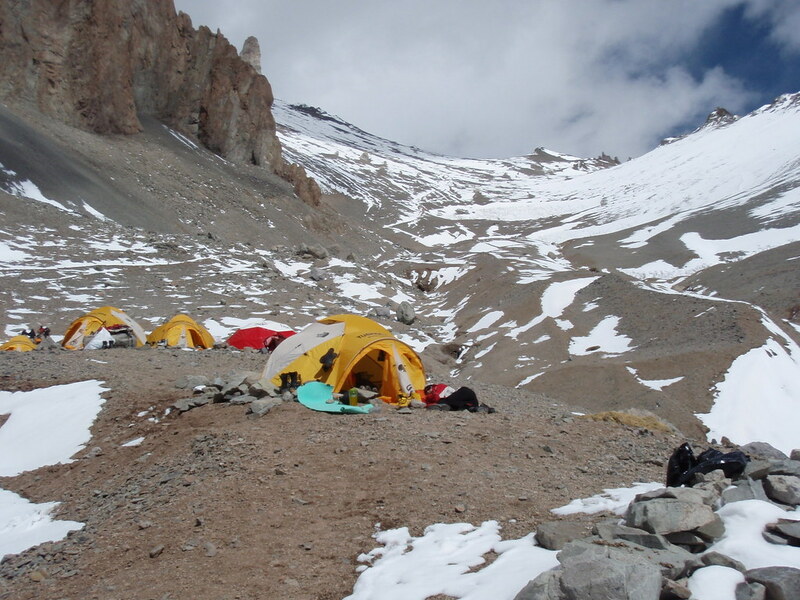 We will break down camp and head out towards Camp 3 “Berlin” or Cólera, a trek that will take approximately 4 hours. During this section of the journey, we will see how the smaller 5000 m adjoining mountains appear to have become smaller and smaller. Before sunrise, we will begin our ascent of the Northwest Face. The first rays of sun will hit us just as we are arriving at Independence Refuge (20.669ft / 6300m). We will continue towards Portezuelo del viento (Col of the Wind) where we can see the route we will travel to the summit. 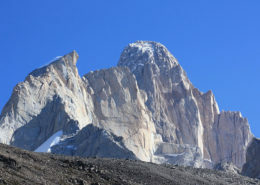 “La Travesia” The traverse that crosses the “Grand Acarreo” big scree area will bring us to the base of the famous “Canaleta”, a steep and precise section. Reaching the Ridge of the Guanaco, the ridge that unites the South summit with the North summit, we will walk not far from the edge, with a close view of the South Face. The landscape and the summit so close will inspire us to dig deep for the last steps. At 22.841ft / 6962m, we will be on the highest point of the American Continent, with an awe inspiring view of the Andean Cordillera. 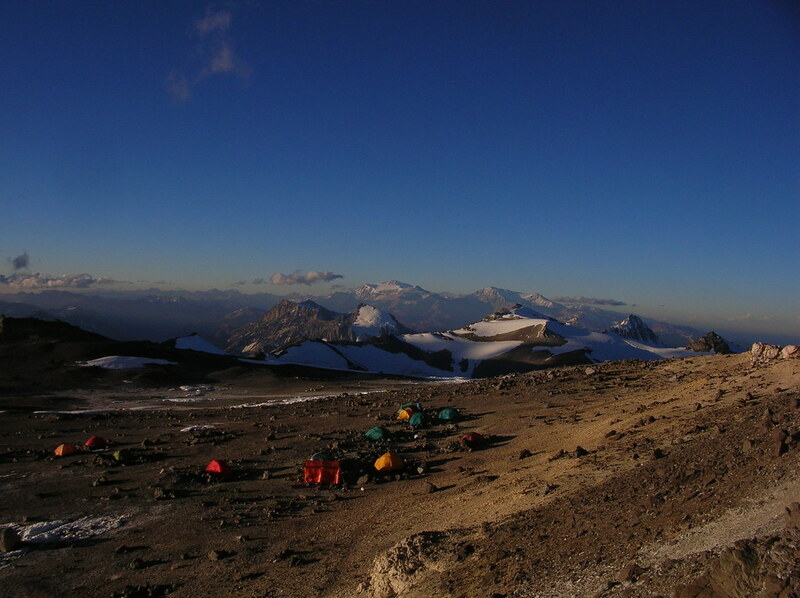 Generally on summit day, from Camp 3 Berlin to summit and back to Camp 3 Berlin takes between 10 and 14 hours. We count these days of the expedition as extras days in case of poor weather or other circumstances that disrupt the normal schedule. These days are added in to increase the probability of summitting. The descent from Camp Berlin to Plaza de Mulas takes about 3 hours. We will retrace the same route we used while ascending. We will finish off the day with a celebratory dinner and toasts with our expedition group members. After breakfast, we will organize the loads that will be transported by mules. This will allow us to travel lightly, with only a small backpack with water, food and an extra warm layer. We will descend via the Quebrada de Horcones. Our transportation will be waiting for us at the Park entrance, ready to bring us back to the hotel in Mendoza. At day’s end, we will have our final feast together and commemorate the experience with a certificate of achievement. Your guide will bring you by private transportation to the airport in Mendoza. All meals and beverages on the mountain. 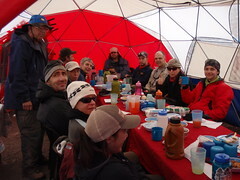 Base Camp, meals served in dining domes.